Early evening at the Mountain Stage during Green Man 2014 with the Brecon Beacons as a backdrop. I’ve become a fan of music festivals over the past few years. There is something very appealing about these enormous tented towns, with their relaxed vibes, which spring up in the countryside for a few days each summer and then, just as quickly, disappear. It is not just the music which attracts me: Green Man festival, set in the beautiful Brecon Beacons, celebrates local food and beer too. There were, apparently, 90 different ales and ciders on offer and, no, I didn’t even think about trying all of them. I can, however, especially recommend Orme, a beautifully flavoured bitter from the Great Orme Brewery in Colwyn Bay. I am proud to say that I did not eat from the same food stall twice during the three and a half days that we were at the festival. One that almost led to me breaking this resolution, however, was Pembrokeshire Beach Food Company whose offerings are also linked to the theme of my blog. They offer a wonderful “seashore wrap” with various fillings (mine had cockles and bacon) wrapped in laver bread. I guess this is the Welsh equivalent to the “all day breakfast roll” that exists in various guises around the country. In the context of a music festival, the seashore wrap has the extra advantage of requiring only a single hand, thus leaving the spare hand free to hold a pint of Welsh ale. Much as I love Goan Fish Curry, that dish really does require two hands to eat whilst at the same time being sufficiently spicy to make a beer almost a necessity. Laver bread, for the uninitiated, is made from the fronds of the red alga Porphyra umbilicaris, a common seaweed on British foreshores, thus illustrating the key message of this blog: that algae, though frequently overlooked or ignored, are actually Very Useful. Pembrokeshire Beach Food Company’s stand at Green Man 2014 with (right) a batch of seashore wraps being cooked. My souvenir from the festival was a small jar of Welshman’s Caviar, laver that has been dried and toasted. The Pembrokeshire Beach Food Company recommended using it as a seasoning, so I tried sprinkling a couple of spoonfuls onto some scrambled eggs. I love scrambled eggs but they are at their best when there is something to harmonise with them. The Welshman’s Caviar added a salty, maritime taste that raised the flavour of the whole dish. Once opened, the jar lasts for a month, so that will give me plenty of opportunity to experiment and, at the same time, relive my memories of Green Man 2014. 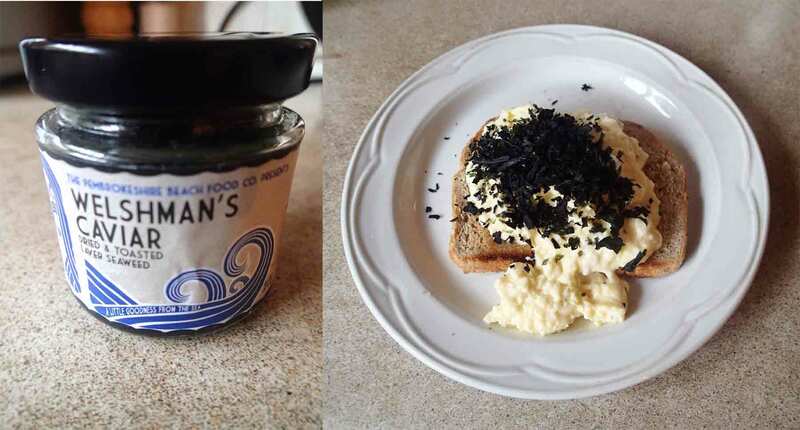 A jar of Pembrokeshire Beach Food Company’s Welshman’s Caviar and (right) Welshman’s Caviar sprinkled on the top of scrambled eggs. 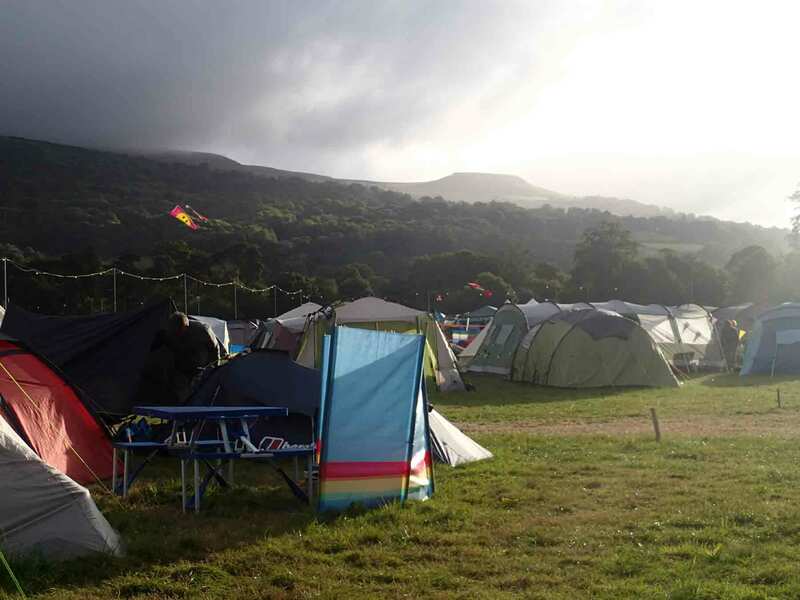 Early morning in the Green Man campsite, August 2014. This entry was posted in Uncategorized and tagged Green Man, laver bread, Porphyra. Bookmark the permalink.